In most graphic novels, the art or the dialogue clearly outshines the other. 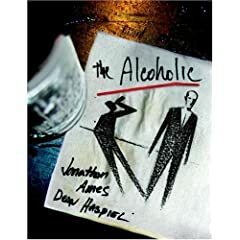 In Jonathan Ames and Dean Haspiel's The Alcoholic, Ames' story and Haspiel's angular artwork work together with rare synergy, creating a wonderfully dark and emotive graphic novel. In what has become known as the "Bret Easton Ellis rule" (around LHB headquarters, at least) I instruct participating authors in this series to submit more than a mere list of songs. In this case, the rule is waived, and Dean Haspiel hopes that this playlist of tunes "will spark associated memories and/or, at the very least, one's imagination."